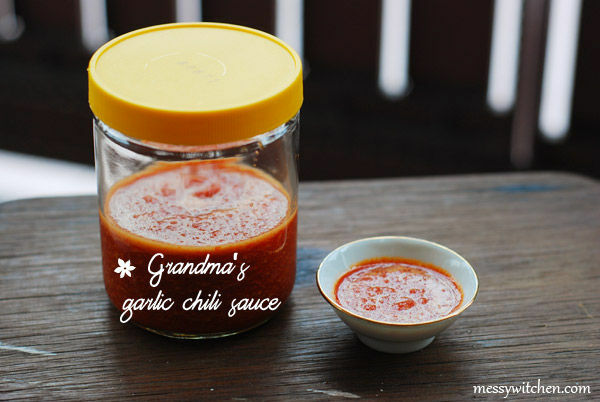 This garlic chili sauce is my very own grandma’s recipe. Back in those days, there were no such thing as tomato sauce or chili sauce. So my grandma came up with her very own version of chili sauce. 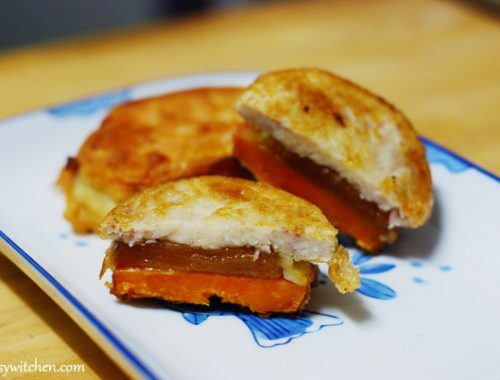 She concocted this recipe during her single days (before marrying her husband). This recipe has stand the test of time. My grandma made this for my mother and her brother and she made these for my sister and me. And now I’m sharing this family tradition with you, my readers. 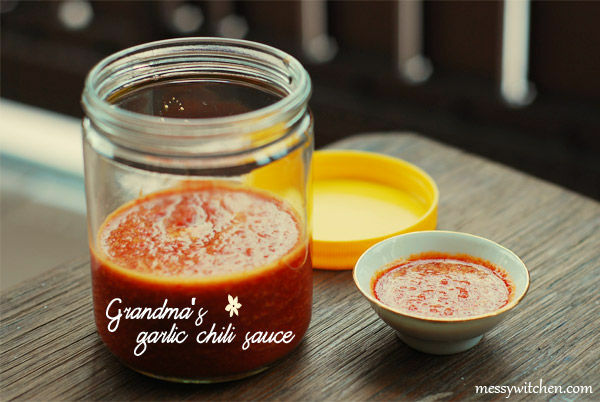 To make this garlic chili sauce, you gotta be a garlic lover and a lover of sweet and sour. This is a chili sauce that will tempt your taste bud in three different senses namely salty, sweet and sour. Deseed the chilies and peel the garlic. Slice the chilies into smaller sizes. Use a chopper/blender. If you prefer, you can use pestle and mortar. Blend until you get a smooth paste. Lastly add sugar, soy sauce and lime juice. Mix well. Pour into an empty bottle and store in the fridge. 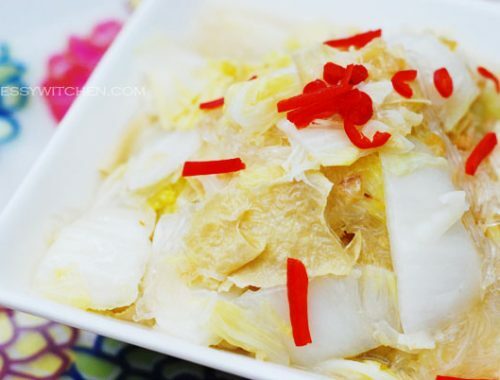 This condiment is best accompany with fish, chicken, fried mee/mihun or even grandma’s fried pork ball dish. The soy sauce, sugar and lime juice measurement above is just my guideline. You should adjust according to your taste. The final taste of the garlic chili sauce should be salty, sweet and sour. 1. 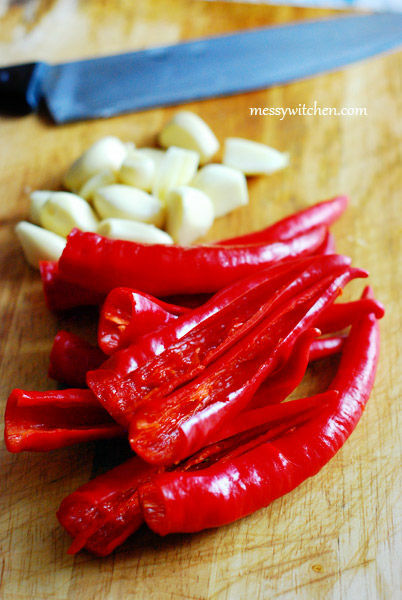 Blend red chilies and garlic until become smooth paste. 2. Add soy sauce, sugar and lime juice. Mix well. 3. Pour the garlic chili in a sterilized jar and store in the fridge. It can be kept for over a month or more. so gonna bookmark this! mami’s friend used to give us bottles of this.. it goes SO WELL with EBERYTHING i kid you not!! Hope you like my grandma’s recipe. I’ve seen another version which uses vinegar instead of lime and soy sauce. so this sauce doesn’t require cooking it, is that right ? also the soy sauce is it light soy sauce ? Hello Che-Cheh just wondering can this sauce be frozen?